Coffee Meets Bagel has launched two new tools to help its busy singles find love. Since 2012, Coffee Meets Bagel has strived to stand out from the swipe-saturated mobile dating crowd. The app makes dating efficient and accessible by presenting members with one curated match each day at noon, eliminating the need to sink hours into searching. The stripped-back strategy won over users around the world, and Coffee Meets Bagel has steadily expanded its reach and offerings over the years. The company secured $7.8 million in a Series A financing round back in 2015 and has introduced an array of new features, including Photo Lab and Send A Woo, in the time since. The latest additions to the CMB family come courtesy of collaborations with Yelp and Spotify. The pair of web apps, called DateSpots.co and Mixtape, are designed to ease the awkwardness of getting to know someone new. DateSpots.co helps singles find the perfect place for a first date. The Coffee Meets Bagel team worked closely with Yelp engineers to build the site. Users can search for coffee shops, bars, and restaurants in their city or neighborhood based on their budget. After inputting the info, the app filters for venues that meet the requirements, have at least a 4-star rating on Yelp, and have a suitable ambiance and noise level. It’s easy to see how DateSpots.co complements the original service. Users can connect on Coffee Meets Bagel, communicate until they’re ready to meet in person, then use Date Spots to find the ideal setting. In fact, according to CMB, 84% of its users say they already use tools like Yelp to review potential date venues. Date Spot just streamlines the process. 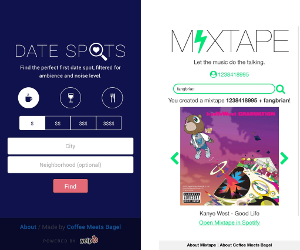 The second new product from Coffee Meets Bagel is Mixtape. Using Spotify’s public API, Mixtape allows users to create collaborative playlists with their dates. After Mixtape plays the tracks you share, it then displays your top three Spotify songs. At the end you'll also find a few favorite tracks selected by CMB for you and your date to check out. Singles across the world - especially Millennials - bond over shared music tastes, and Mixtape encourages the process by making it easier to discover what you have in common.